Disclosure: My family and I were hosted for a Hard Rock All Inclusive vacation by Hard Rock Hotel Riviera Maya for purposes of Review. 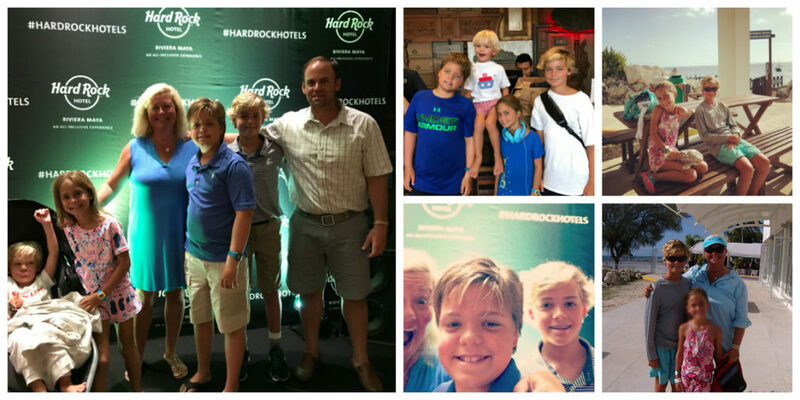 Thank you to everyone at Hard Rock Hotel Riviera Maya for an unforgettable vacation! All opinions are my own. Our Hard Rock All Inclusive Riviera Maya was super fun. 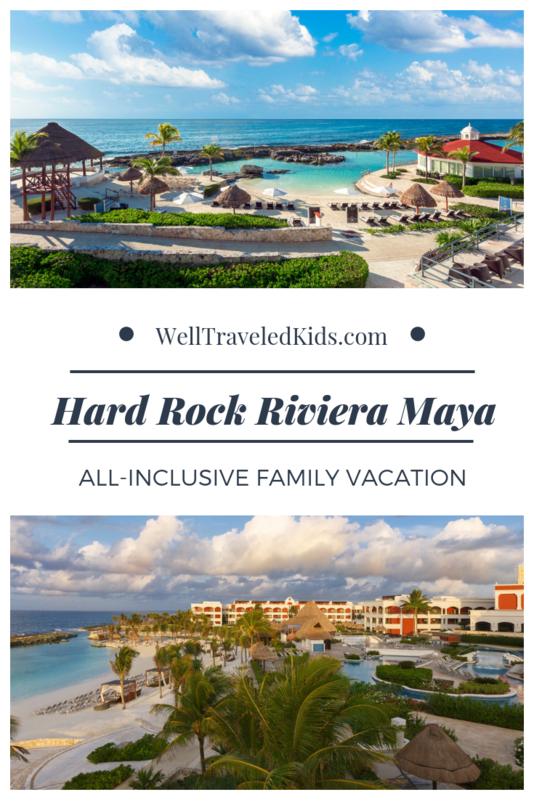 As a family of six, we don’t often agree on activities, but at Hard Rock Hotel Riviera Maya, it was easy! We could swim, hang on the beach, race on the water slide, try out the zip line, and have a bite to eat whenever we grew hungry. Whether yummy ice cream or chocolate eclairs from Cafetto, located on site of the Hard Rock All Inclusive Riviera Maya. As many activities as were available. It was easy to find time and space to relax at Hard Rock Hotel Riviera Maya. I took a mom break and tried out the largest spa in the Caribbean, located on site of the Hard Rock All Inclusive Riviera Maya. I booked a massage and spent some quiet time in the steam room. My husband and I enjoyed some quiet beach time while the kids were busy with planned activities. Those activities were offered at no charge through the resort. I also enjoyed my coffee almost every morning on my private terrace with a view of the ocean. Private terrace was available with every room, complete with a hammock and view of the ocean. The lush grounds of the resort beckoned us to explore the many paths and trails that connected our resort to Heaven, the neighboring Hard Rock resort. My children marveled at the crystal blue colors of the sea that you could see from almost any spot of Hard Rock Hotel Riviera Maya and we decided there was nothing more lovely than white sand and an endless ocean. Each day, we planned where we would have our all-inclusive meals. We learned early that it was helpful to make reservations. Reservations were easy to cancel if we got busy or felt like seeing a show. There were several go to restaurants at Hard Rock Hotel Riviera Maya that didn’t require a reservation. We enjoyed The Market most days for breakfast. You could order an omelet, choose from fresh pastries or have a good old-fashioned bowl of oatmeal or fruit loops. Our children loved the wood-fired pizza oven of Pizzeto, located conveniently by the pool and I found myself adoring cheeseburgers grilled right by the pool. We made reservations at Ipanema where we had a “fancy” steak dinner with our older three children. It was conveniently located to the Kids’ Club where our four years old had dinner and played with water balloons! Our last evening’s dinner was truly a show, with a well-executed performance at Zen, right off the lobby. Traditional Asian cuisine and an amazing chef that dished up Hibachi chicken and steak, as well as some scrambled eggs for our picky eater! 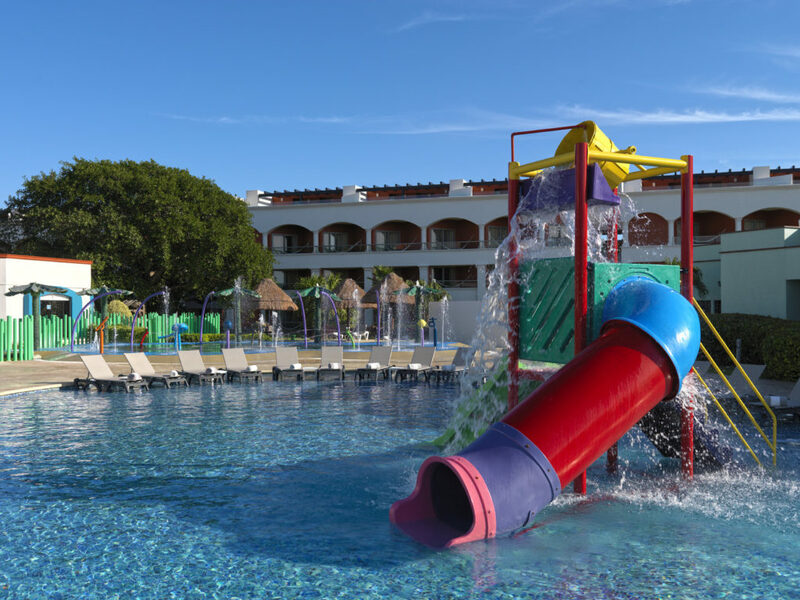 The Hard Rock All Inclusive Riviera Maya is made for children without losing its five-star appeal for parents who long for beauty and serenity amidst child-friendly activities. If anything, we needed a few more days to take advantage of all the fun here. 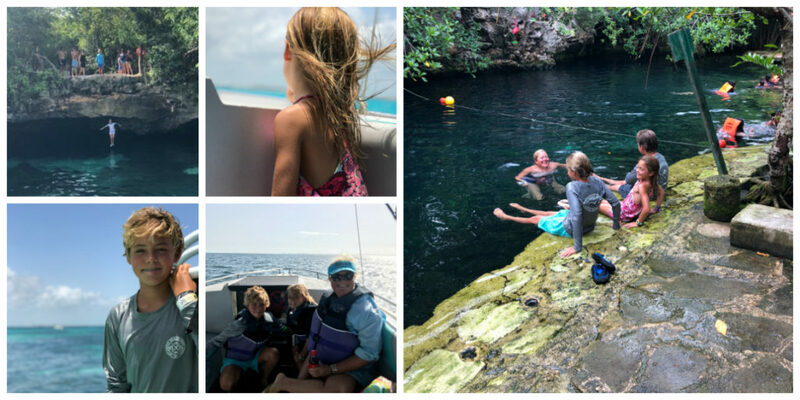 It was hard to choose between snorkeling or floating on the lazy river between trips down the tunnel water slide or the zip line, a short climb away. 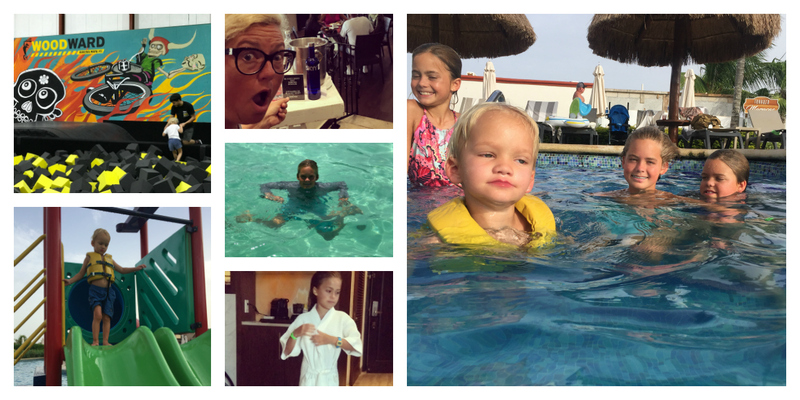 We adored the evening shows and lobby fun which included a magician and whacking a piñata. 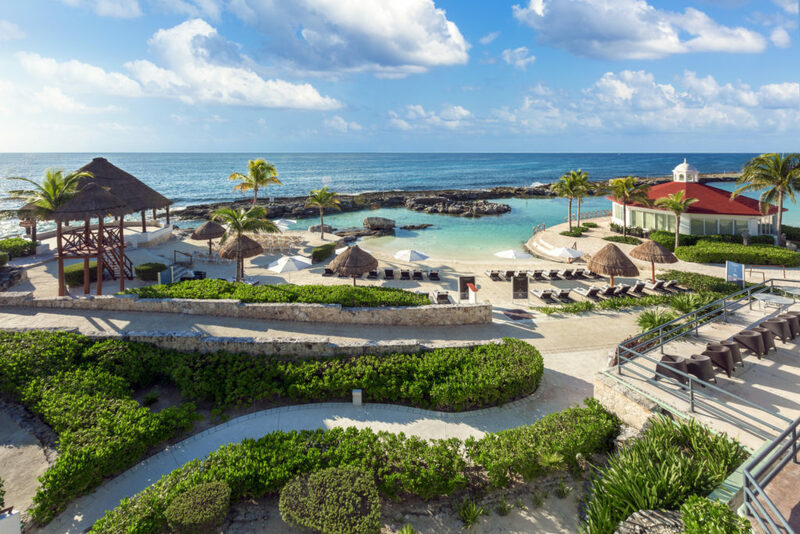 Steps away from Hard Rock All Inclusive Riviera Maya is the brand new Woodward, a one-of-a-kind experience in 20,000 sq. ft. of indoor space. Our youngest adored the two-hour slot each morning for children under age six where he bounced and slid and climbed, all with the help and assistance of incredibly kind and welcoming staff members. While he played, my older children took an opportunity to play some video games and foosball over at the Cavern Club, just for older kids, part of theHard Rock Hotel Riviera Maya. When it was their turn at the Woodward, they explored the ramps with scooters and even pretend skis. 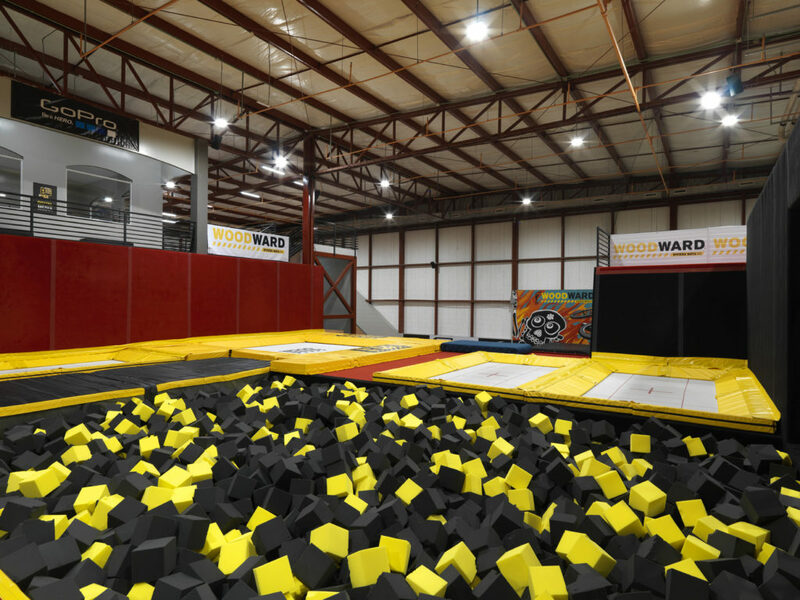 Yes, a wide array of sports programs were available including BMX, skateboarding and indoor dry land snowboarding and skiing. All training equipment is included in your entry pass, available by the hour, day or week. Several afternoons of our stay at Maya, we took advantage of hotel excursions and explored the community of Riviera Maya. Our favorite trips organized byHard Rock Hotel Riviera Maya was to the caves located along the Yucatan peninsula. Never before had we heard the term “cenote” and quickly, we were hooked. The Hard Rock All InclusiveRiviera Maya led us to two of the region’s most incredible cenotes, natural sinkholes that expose groundwater underneath, making for a refreshing and amazing swim experience. My older children worked up the nerve and jumped from the twenty-foot cliffs, manned by cenote employees and competent tour guides provided by the Hard Rock Hotel Riviera Maya. Don’t forget to bring some money to purchase fresh mango and watermelon, freshly cut and served by local vendors. The Hard Rock All Inclusive Riviera Maya directed us to take advantage of swimming with whale sharks. It was once in a lifetime opportunity to swim with whale sharks. They migrate each August a short drive away from the resort. TheHard Rock Hotel Riviera Maya lined us up for a boat trip and nearly thirty minutes later, we came upon dozens of the worlds largest and kindest creature. Our boat captain directed us when and where to jump and we marveled at the beautiful creatures. Following the experience, we traveled to a lovely beach. Our captain and first mate fixed fresh fish on the back of the boat. There was something for everyone everywhere that we traveled on the grounds of the Hard Rock All Inclusive Riviera Maya. The pools included a lazy river, water slide, and a swim-up bar. It also had a zero entry kids’ area, complete with play equipment, small slides, and fountains. 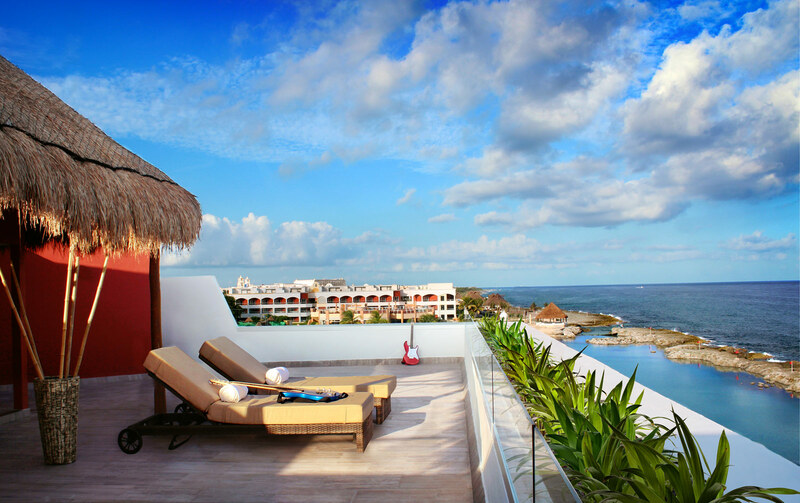 Never leave the water and order a daiquiri or a chocolate milkshake hard Rock Hotel Riviera Maya. Adrian H. Wood, PhD is a rural Eastern NC mother of four, one with extra special needs. Past preschool teacher, nanny, children’s ski instructor, early interventionist, college professor, early childhood researcher, wife and full time mama. In writing after a twenty year hiatus, she offers personal glimpses where satire meets truth, faith meets irony, despair meets joy and this educated debutante escapes the laundry and finds true meaning in graceful transparency.